Just across the Costilla-Conejos county line, landowners are planning ways to live off the grid, build their homes and have private lives. They say over-zealous code enforcement and law enforcement have made it difficult, and have video evidence to back it up, that this hasn’t been the case. It turns the clock back to the 1980s, when the Federal Trade Commission issued an order returning money for the same lands to their persons who had purchased five -acre tracts, sight unseen, on the basis of promotional materials. The roads built by those earlier developers remain, along with forbidding conditions, expensive utilities and a low water table commanding deep and expensive wells. Now, adding a new thread to the land developers’ sales tapestry is the fact that people cannot obtain permits to live on their land in RVs or camping trailers while they build their homes. The developers advertise that the areas are zoned residential and two homes are allowed on each small “rancho,” the main house and a smaller one. Tell that to Bob Pinnick lives on the side of a mountain above Colorado Highway 159 and didn’t meet with the group on Monday, but says he has talked one-on-one with most of them. (Photo by Sylvia Lobato) Bob Pinnick stands outside the RV he is using for a residence while he builds a home on land he owns above Colo. 159. 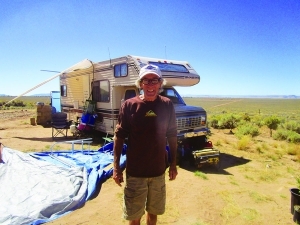 The developer who sold him his land said he could get a permit to live in his RV until his home was built, but Costilla County has denied him the essential permits, instead, a code enforcement officer dressed in full body armor served him with an eviction notice. He says he was told by the person who sold him the land that he could live there for up to a year while building. When he went to obtain such a permit, he was told they were no longer being issued, but he could have a six-month permit. He asked to buy a permit for the current six-month period and the next one, as well. It didn’t happen. That was a common complaint voiced by the nine people gathering Monday to talk with the press. Surnames are not used for fear of retribution. Leslie and Tyler, parents of two daughters, said they have been portrayed as people who don’t want to follow the rules and codes, but that isn’t the case, they aren’t allowed to live on their land unless they spend money they don’t have to live on a grid they don’t like. They entered into a purchase contract with developers that offered a one-year guarantee that they could live in a camping trailer or RV on their land while building a home. “It was a one-year guarantee that if there was no water, the seller would give us another place that did have water,” said Leslie. It didn’t happen. “We have sought the necessary permits, but we can’t get them,” said the young mother, dressed neatly in clean jeans and shirt, with a straw hat on her head to ward off the sun. They, like Pinnick, lay some of the blame on the land sellers and their empty promises. Due to the location of his land, along a rugged road that isn’t maintained by any governmental entity, the code enforcement officer and a deputy sheriff visited him to serve him an eviction notice, citing his non-compliance with sections of the land use code, with no further explanation of what those violations were. The code enforcement officer wore body armor and carried a pistol. He doesn’t have a copy of the land use code and has no idea what the sections are. Pinnick is buying his land and also must buy water. He has a generator for electricity and an indoor bathroom and toilet, which he empties regularly. According to Pinnick, the code enforcement officer arrived at his place, driven there by a deputy sheriff and was in full body armor, armed with a pistol. A retiree who has been a semi-professional musician, Pinnick is a man of peace. All he wants is to build his home, grow his garden and be left alone. Sundance, another resident, says, “I’m confused. I bought a permit in March, no problem. They never messed with me at all. Since he and a friend are building an earth bag home, he is concerned about the requirement for an occupancy permit. “There’s a misunderstanding of what we are doing here,” he added. Another resident, Manny, said the residents are united in their opposition to the regulations. “The glue that has bound us is these regulations. They have caused us to unite. A group of county residents was pushed down the street by sheriff’s deputies after the Planning Commission meeting on Sept. 9, and it was videotaped by three separate persons. Manny said the group wasn’t a crowd, but rather people gathering to discuss the planned code changes and tactic of not issuing permits. The incident took place after a planning commission meeting as people gathered on the street to discuss what they had heard. No decision was made at the meeting because there wasn’t a quorum, but public comment was received. The deputies featured in the video repeatedly threatened some citizens on the street with arrest if they did not move down the street and away from the county building in response to a light argument in the crowd. As seen in the video, several citizens were repeatedly accused of being disorderly, aggressive, and threatening as the excuse given for the aggressive and invasive violation of their First Amendment rights. Undersheriff Andrew Espinoza is repeatedly heard threatening the crowd with arrest while another officer can be seen displaying his cuffs. Meanwhile, Neale Taylor was sitting on a windowsill listening and watching until he was placed under arrest for disorderly conduct after saying something to a Costilla County deputy. Taylor was there to attend court with his wife, Penny, who faced up to 6 months in jail if she was unable to get all her property, including structures, off several plots of land which they own. Penny, who is the owner of record, has been in litigation with a neighbor for about five years, and then the county became involved. The neighbor, Timothy Leggett, ordered them off land that they own and a deputy sheriff shoved her when she refused to sign the paperwork without reading it first. Neale was arrested and released within a hour. Neale said that deputies told him that if anything happened to them, they would hold him personally responsible and charge him with a felony. At the Sept. 9 planning commission meeting, Leggett maintained that changes to the residences would “improve the community” and end problems with law enforcement and child protective services. Independent film maker Alex Ansary said the videos, which can be found on YouTube, were of incidents talking place shortly after residents first raised concerns about the proposed changes to county land use codes, changes they feared would take place in violation of the Sunshine Law. The next meeting will be at 1 p.m. Oct. 14. “The purpose of this letter is to formally inform you of repeated trespasses on our private properties by agents of Costilla County Planning and Zoning, which we presume to have been unlawfully authorized by you,” he wrote to Sheriff Amos Medina. If you believe this right has been abrogated by some statute, code, act, ordinance or otherwise, please state the corresponding book/number/section of the specific rule which allows you to ignore this guarantee, otherwise it is presumed you are operating in a treasonous capacity. If you presume that we the people can be lawfully subjected to unwarranted inspections of our private dwellings for the purposes of commercial/residential code enforcement without warning, there is no need to respond to this letter. “Their very own proposed land use code changes would essentially criminalize those living here in a RV/ Trailer or in other unconventional ‘off the grid’ method for many of the residents in the San Luis Valley. That includes compost toilets, hauling on one’s own water and using solar or wind for basic energy needs. Traditionally, this has been one of the freest and most affordable places in all of North America to get away from it all. But as experienced visitors know, it takes a tenacious spirit to ride out the cold, wind and wild terrain with the nature of the land itself,” Edwards wrote. Veteran Kicked Off Land for Tiny Home under 600 Sq. Ft.